This is what it looks like when three guinea pigs full from their evening meal conquer one well trained human to use as their personal piggy couch. 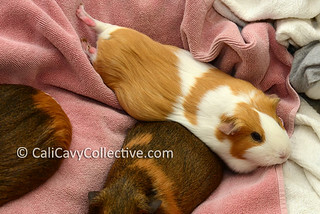 Truffle, Belka, and Peaches provided the perfect illustration of Cavy Couch Syndrome: a classic condition where the afflicted piggy slave has been employed as a couch and is prevented from moving for fear of rousing a happily settled peeg. Common symptoms include feelings of fondness, guilt at moving, or numbness in the utilized limbs. Belka was so relaxed, she didn't even protest when Peaches sprawled across her rear and used her as a pillow. After all, there's nothing like quality potato couch time to help you recover from a food coma. On the other hand, it does make it difficult to visit the bathroom or move more than a few millimeters when you have approximately 8 pounds of pig fast asleep in your lap. 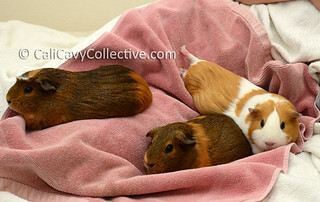 Does anyone else routinely suffer from Cavy Couch Syndrome? I haven't suffered this in years. Noli might be a lap-pig, though. I love the pics! I love lapping piggy photos. I love Peaches chubbyness! Its soo adorable!! Ok Peaches cracks me up, especially how she is sprawled all over Belka! Fergie is our snuggly peeg and she gives us Cavy Couch Syndrome all the time. Yesu two boys love that. But they sit on my lap separately cause they can't share me their mommy!